When it comes to healthy eating, fad diets and quick fix solutions just don’t cut the mustard. Keeping fit and healthy means creating a long term, balanced lifestyle and making smart decisions about what we eat each day. However, that doesn’t mean you should compromise on taste. Rather than denying yourself dishes you love, there are plenty of tweaks you can make by opting for healthier alternatives when it comes to your ingredients. A lot of the time you won’t notice the difference and you certainly won’t be losing out on flavour. Here are some of our favourite healthy eating hacks that allow you to chow down on meals you love, without compromising. The most important thing to remember about breakfast, is to eat it! Starting the day with a nutritious meal not only helps to boost your metabolism but it also means you will avoid sugar cravings later in the morning. A bowl of porridge is the perfect source of fibre and doesn’t have the high sugar content that some other cereals have. 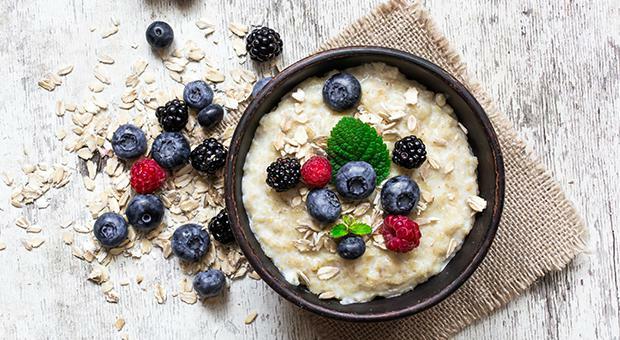 Although porridge is traditionally made with either water or cow’s milk, there are lots of other ways to enjoy this meal. Oat milk offers a burst of vitamins and minerals in the morning, in the form of a creamy and luscious breakfast that feels totally indulgent. Other ways to spruce up a bowl of oats is to add some texture. A handful of seeds, nuts or fruit makes a big different to the taste and the nutritional value of the meal. Planning your lunches at the start of each week means you will be less likely to run to the local deli or bistro for meals that are high in salt and fat. If you have access to a fridge in work, start making use of it or invest in a cool bag to take with you each day. Choosing the right midday feast gives us energy to stay focused and reduces the chance of ‘hanger’ around dinnertime. Instead of cutting bread out altogether, try swapping plain white bread for wholegrain or multiseed. It is equally as delicious and has far more nutrients than its basic counterpart. The thought of salad at lunchtime might not seem like the most filling of meals, but quinoa and lentils make a delicious and filling base. Both are also a great source of protein, minerals and vitamins. You can use these superfoods as your starting point and then add things like chopped sundried tomatoes, herbs, olives and prawns to make a tantalizing lunch time meal. Takeaways and fast food can seem like a good idea at the time, but what about the negative health effects? Eating too much fast food can lead to conditions like diabetes and cardiovascular disease. So, cutting down on these is one of the most important steps to take when improving your lifestyle. ‘Fakeaways’, where you recreate your favourite take-outs at home, are a satisfying alternative. ‘Fakeaways’ strike the perfect balance between choosing a healthier option while avoiding that post-feast guilt. Homemade pizza is a great place to start. Top a wholemeal pizza base, or even a seeded wrap, with a simple homemade tomato sauce, plenty of fresh veggies and, for a lighter alternative to mozzarella, opt for a plant based cheese. Try making turkey mince tacos with homemade guacamole next time you feel like a Mexican treat, or if you are craving a burger use lean turkey patties instead and top with your usual favourite veggies and sauces. Homemade Asian-style dishes are the go-to meal on nights you feel like a takeaway. Use buckwheat noodles for a fat and cholesterol-free alternative to egg noodles, or if you love rice with a stir-fry choose brown rice. Pack your dish with tasty cashew nuts, a lean protein like chicken, coriander, plenty of veggies and organic soy sauce for a delicious dinner. Whether it’s on the go, between meals or when you simply fancy something nice, we all love a tasty treat from time to time. But, with so many options available, it can be hard to know which snacks to enjoy that won’t ruin all your good work. Thankfully, there are some obvious choices out there, such as the new Ancient Grains range from Velvet Crunch. Made using our favourite superfoods - lentils and quinoa, their new Sweet BBQ and Chorizo & Red Pepper snacks are scrumptious. And, with less than 100Kcal in each bag, you can enjoy a healthier option snack, without the guilt.